People who love salads usually love baked potatoes. But, like the salad, the potato has a hard time staying healthy because of the toppings (bacon bits, cheese, sour cream…oh my!). On it’s own (and with the skin still on it) the potato is a low calorie, high fiber food. It is an excellent source of vitamin C, B6 and fiber. It’s also very dry and simply must be topped with something, but let’s try not to ruin it today. Now, you don’t have to do what I do, but that’s not going to stop me from suggesting it. Once a week (sometimes a little less often), I stuff a ten pound bag of chicken (seasoned with a small amount of salt and pepper) into my crock-pot. I normally do this right around dinner time, and I let the chicken slow cook for about four hours. Once the chicken has cooked, I remove the lid, turn off the cooker, and allow the chicken to fully cool. If you learn one thing here today, let it be this: Never try to handle hot chicken! After I have deboned the chicken, I return the bones to the crock-pot. I then add a stalk of celery, a carrot, four cloves of garlic, half an onion and a deveined jalapeno pepper. I fill the crock-pot with water (leaving a few inches of space at the top), turn the heat to “low,” and allow the stock to simmer until morning. What do I do with all of this chicken and stock? Well, while I can’t promise it will always go as far as it did here (and yes, I did feed my family that many meals on a seven dollar bag of chicken), we’re going to be using a little bit of both today. My first suggestion in this recipe would be that you slow bake your baked potatoes. I suggest an oven of 325 to 350 degrees for about four hours. I absolutely forbid a microwave. 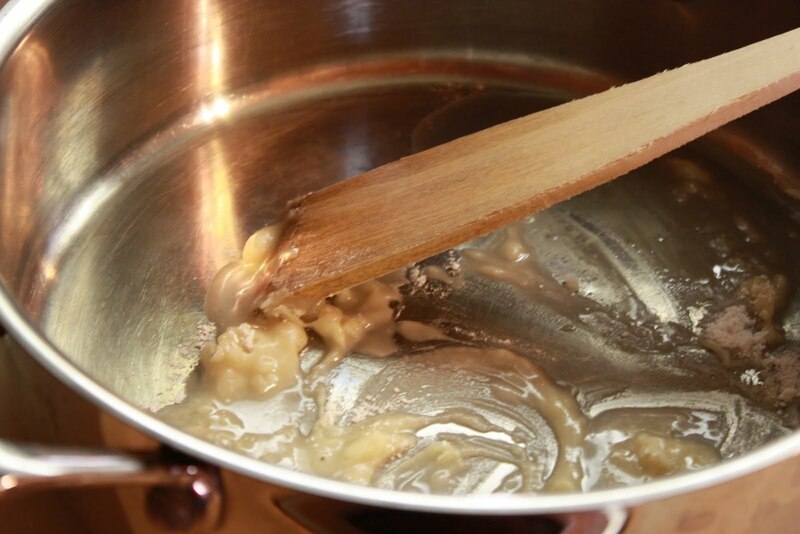 For the sauce, start with two tablespoons of your favorite cooking oil (I just used vegetable), and heat it over high heat in a deep pan. 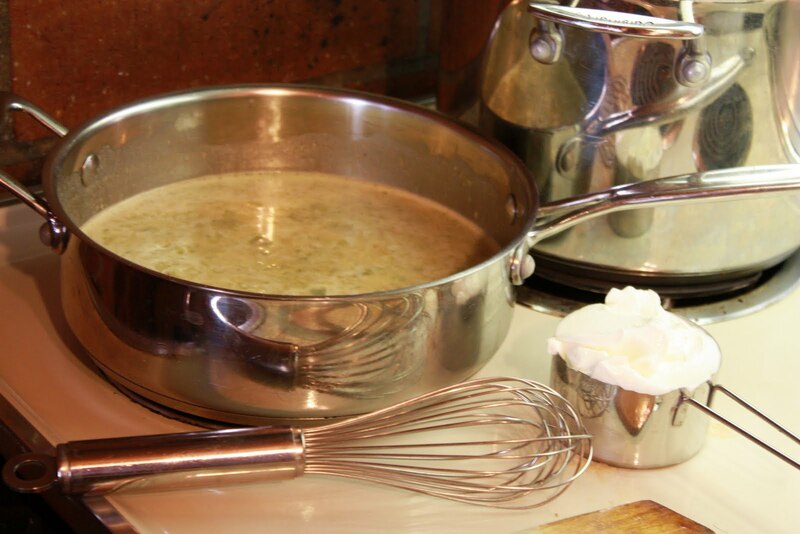 Quickly mix in two tablespoons of flour, and cook to a golden brown. And 8 full ounces of low-fat sour cream. Season with salt, pepper, and a generous teaspoon of cumin. And with that, your sauce is done! 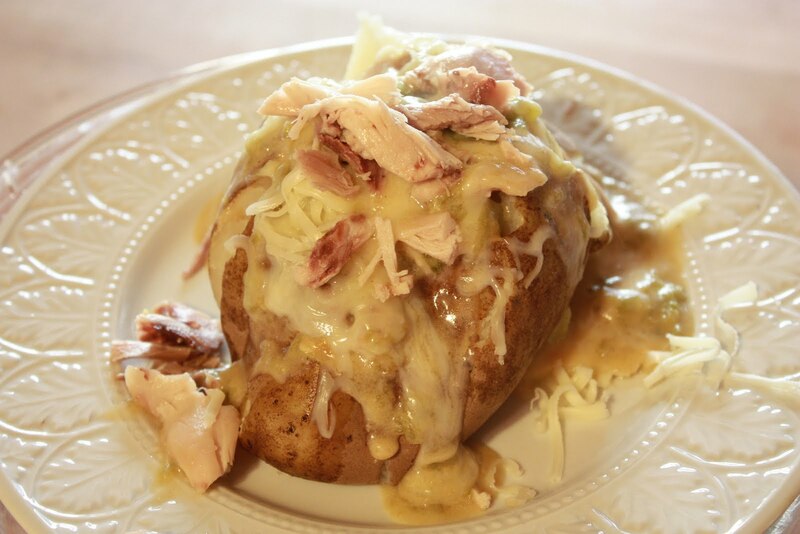 Top your potatoes with chicken, monterey jack cheese and sauce for a delicious and moist potato. 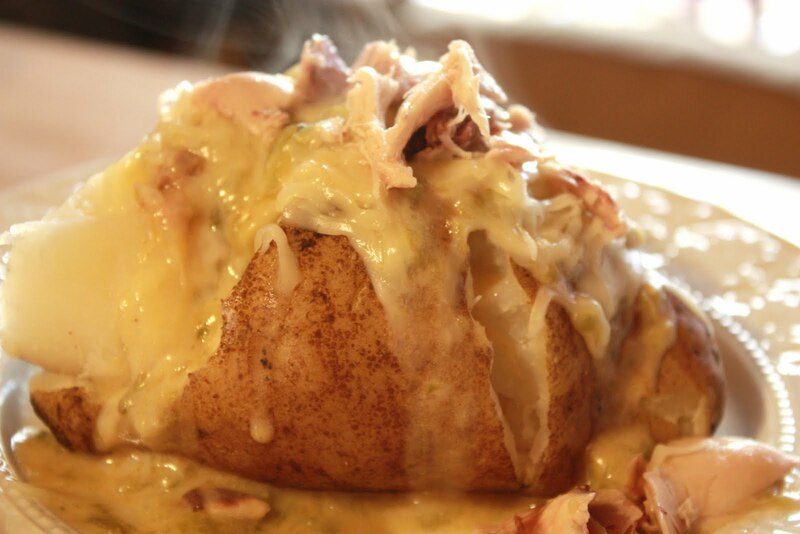 Do you have a favorite baked potato? I’d love to hear from you! Oh my, Sarah…those look SO YUMMY! 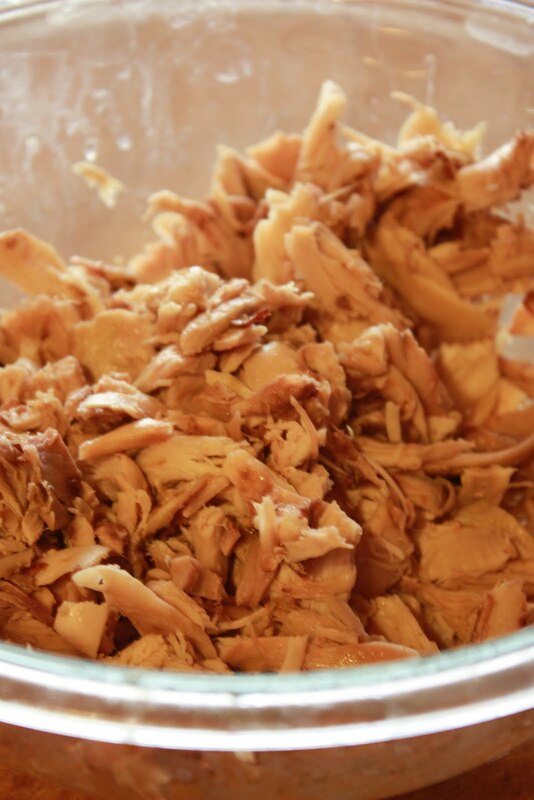 I often do the same thing with chicken and stock…I just can't bring myself to buy the canned stock when it's so easy and healthy to make at home. That looks so delicious, Sarah. I might have to try this. My kids love potatoes. That looks so good! And healthy! I think even my super-carivore hubby would like that. 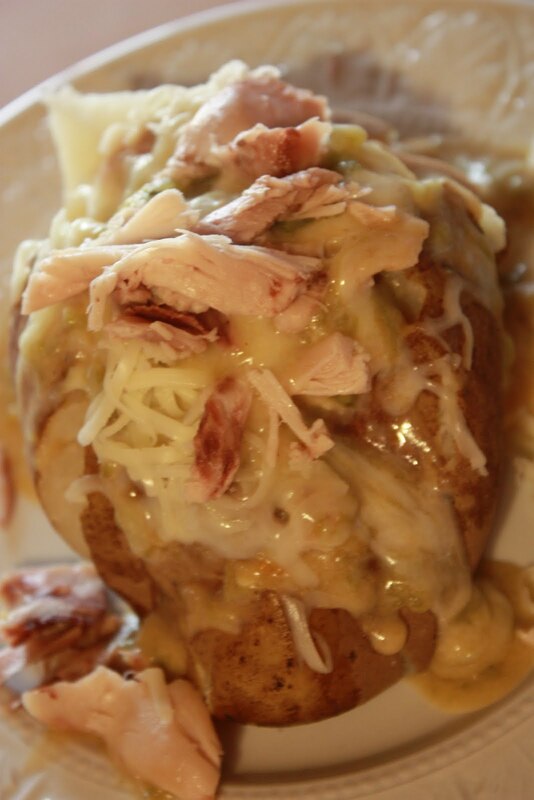 We have put salsa and low fat cheese on potatoes before…yum! This sounds great and perfect for the budget! Thanks for the idea. We are always looking for slow cooker ideas. YUMMMMM Sarah! Thanks for sharing! Looks sooo good! I need to make this this weekend! Thank for sharing. Yum, yum, YUM!!! This looks and sounds delish!! I am looking forward to slow-cooking my potatoes. I am forever trying to rush them, poor little guys. 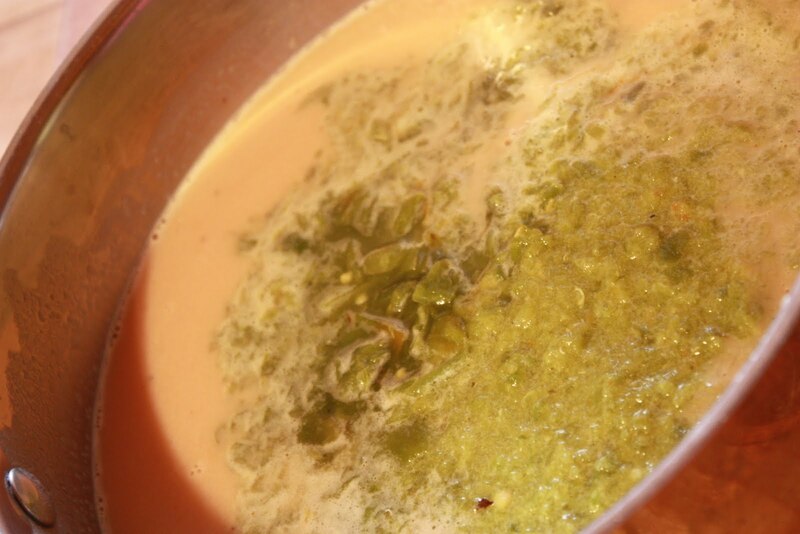 My Oklahoma hubby will love the Southwest flavor of the green chilis. My favorite baked potato is just plain ol' FF sour cream. But this, oh this, is a meal!! !